Stage Manager Nathan Waits reviews the multitude of light cues for Footloose with lightboard volunteers Joseph Kirven and Jake Jordan in the tech booth of the CAC. On the left, his freshman shadow looks to the stage as Waits, Jordan, and Kirven count over one hundred light cues― more than any Sage Creek musical done before. “Lights and shift, standby for blackout,” senior Nathan Waits, dressed head to toe in black (a drastic change from his usual plaid), says into his headset. Behind the scenes of the stage below, tech crew volunteers line up in the dark wings with props while a student prepares to shut off the stage lights from behind the audience. “Lights and shift crew, go.” In the ensuing darkness, half a dozen high schoolers scuttle onstage, all in black as well, to set down the table and chairs as quickly and quietly as possible, tip-toeing out of the way just in time for two more students to roll a full-sized door into position. Waits winces as the squeal from the brakes is audible from the booth behind the house. “Stage right clear,” comes the voice of a crew member hidden from Wait’s sight through the headset. The stage is suddenly illuminated, actors posed in the chairs or waiting behind the door. Music begins as Waits flips a page of notes for the next shift sequence. Waits, known by the stage name ‘Baby Baby Waits,’ has been stage manager for the Sage Creek Drama Department for three years now. “Footloose” is his last full-length musical as a high school student, though he plans on continuing in theatre once he graduates and looks forward to working at the MiraCosta College theatre. His own first musical was also Sage Creek’s first: “Grease.” Here the seeds of his love for tech theatre, inspired by his older brother Jeremy Waits (who also volunteered at the Cultural Arts Center (CAC)), really began to grow as he worked on stage right shift crew with a small group of freshmen and sophomores, the only grade levels enrolled at Sage Creek at the time. Nowadays, Waits can say the same of himself, especially in regards to the late nights. Most tech crew volunteers go home around the same time as the cast, approximately half past nine each night; however, Waits and the theatre operators often stay longer, touching up light cues or amending conflicts in cues. Some nights, they stay for at least an hour after rehearsals end, until the theatre is forced to close for the night. 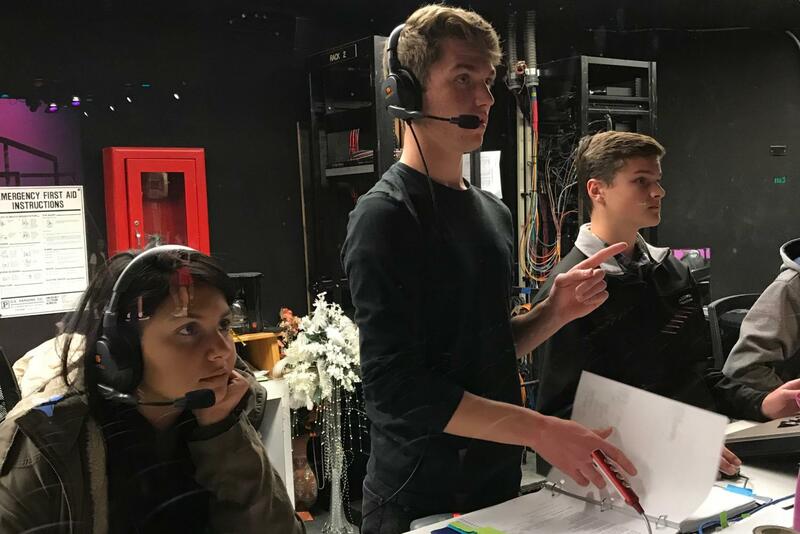 Much like his brother left memories at the CAC, (along with an electric drill labeled ‘Waits’ in sharpie, no doubt lost somewhere in the booth) Baby Baby Waits will leave the legacy of a tech crew for Sage Creek High. The Sage Creek theatre director and drama teacher Jillian Porter recognizes all the work Waits has put into his time here. 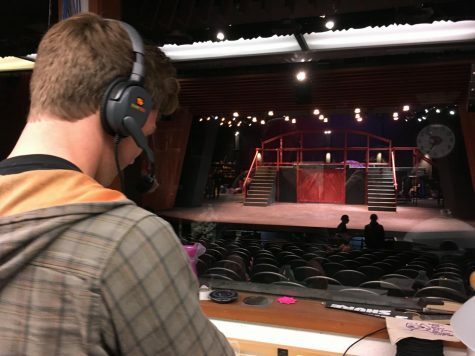 From the tech booth behind the audience, Waits oversees light, spotlight, shift, and actor cues, consulting his binder of notes and scene changes every couple minutes. Hours at Footloose rehearsals in the CAC were spent practicing these cues over and over again. “He, and a lot of the seniors, have really established a really solid, friendly, committed tech crew for Sage Creek. When I walked into this job I don’t think that was something that I recognized how important it was until I saw it in action and now we have such a great crew thanks to Nathan and the seniors,” Porter said. Four years of dedicated volunteer time has made a lasting impression on the Sage Creek Drama Department and will surely be remembered for many years to come. Waits first approached Porter for the role of stage managing in his sophomore year and she agreed, seeing that a leader for tech crew would be a great help and important for the backstage mechanics. His work has not been confined to the CAC and Sage Creek, however; Waits took a liking to being the head of a multifaceted team and has worked on multiple plays with the Carlsbad Community Theatre (CCT) at the Avo Playhouse, where he’s gained considerable work experience and hundreds of community service hours. As soon as the 2018 Sage Creek musical was announced to be “Footloose,” Waits was formulating plans based on past experiences at Avo. Before rehearsals even began, he had a light scheme in mind for certain songs and scenes. As hardworking as he is, Waits refuses to kick off his Sunday shoes and cut loose until every detail is as he envisioned or believed best. These skills Waits has gained through the years of dedication in theatre have proved useful outside the tech booth as well. Through teamwork and leadership, Waits has become a confident student in his senior year with his life all before him and plans already in the making to travel, to tech, and to make the most of the next couple years. Proof of his hard work came to light after the curtain closed on “Footloose” for the last time at the CAC. He was approached by the CCT Board of Directors and offered an opportunity for paid work with the theatre. Numbers were exchanged and with an enthusiastic yell, Waits sprinted backstage to celebrate. Congratulations were heard for most of the night. Waits recommends high schoolers join theatre, either backstage or in the spotlight. Through Sage Creek Drama, he found a family and some of his best friends who, much like the musicals do themselves, take him to another world and give him a little tune to carry in his head when he’s feeling blue, as Man in Chair would say.